Having everything packed before the movers arrive saves time on move day. Whenever Fantastic Moves does the packing prior to moving, the move always goes very efficiently and rarely does anything ever get damaged! Although we prefer to be responsible for packing, some customers insist on packing themselves which is perfectly fine as long as everything gets packed properly. Here are some tips to help you pack as safely and efficiently as our professionals! Pack everything small enough to be in a box before the move. Get started by packing items you will not need every day. 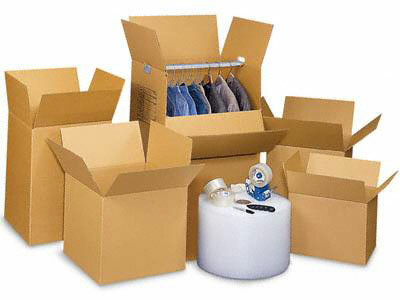 Do not overload boxes- pack heavier items in smaller boxes and lighter, bulkier items in medium to large boxes. See our Boxes and Packing Supplies list for more information. Use clean, new professional moving boxes if possible. They are designed to protect your belongings better than grocery boxes and are easier to stack and load on the truck. Use packing tape to seal your boxes instead of duct tape which doesn’t adhere to cardboard. Seal all boxes so they are stackable. (Interlocking the flaps is not sufficient). Use a table top with padded surface for your work area when packing / unpacking breakables in case you drop an item. Label each box with room where each box is to be moved in your new home. Label on top and sides of box. Briefly list contents. Use permanent marker. Empty filing cabinets down to at least the bottom two drawers so they can be moved safely. You can leave clothing in dressers, but remove any breakables or heavy items from the drawers. Wrap lampshades and fine china/crystal in bubble wrap, packing paper and tissue paper. Avoid using newspaper because the ink may cause permanent staining. Keep important legal documents, family medical records or valuables separate and transport them yourself to your new home. Pack a box labeled “Essentials” of things you will need immediately at your new home. Make sure it is the last box to be loaded on the truck so that it will come off first for your convenience. It is illegal for a moving company to transport hazardous materials such as gasoline, bottled gases, flammables, firearms, ammunition, explosives, alcohol, cleaning fluids, drugs and detergents. Other arrangements must be made for moving these materials.